That is how fast our wedding is going to be here. I can't believe it's coming so soon! I have plenty of things left to do, but I really have a great deal finished. Today Josh and I went and picked out his wedding band. It's the most wonderfully simple ring possible. I mean it. Here is a picture of it with my ring, just to make the picture more exciting. Yes, I am available to photograph weddings if you want me to. I'm quite professional. In the mail today, I got an invitation to my wedding shower. 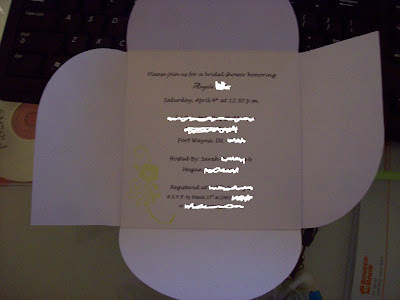 Sarah spent so much time working on these invites. I love them. Yes, I erased almost all of the info, because you people on the internets are crazy. We met with our pastor this morning. We had to take an online compatibility survey to make sure we could get married. I'm serious. Anyway, our results were "keep up the good work!". So, woo hoo, we really are compatible. We needed a survey to tell us that. We were talking to our pastor and he was saying that there are a lot of couples who go into marriage not believing that it will last forever. Why would you get married if you didn't think you'd be with that person for the rest of your life?? I sure wouldn't. Our pastor said he still marries those people. I would have a problem with that. He said he's only not married one couple, because on the survey, the groom said he really didn't want to get married, but thought he had to or they would break up. One question we didn't score well on was: "When I have children, my lifestyle won't change much." We both answered "agree" and the survey said we had unrealistic expectations. Our pastor remembered the last time we talked to him how we said that we don't go out, we stay home and watch movies (like tonight...and every other night)...and he said that we answered the question correctly and that it was directed toward younger people who do go out all the time. I hate when tests try to categorize everyone together. Isn't that kind of stereotyping young couples?? Anyway, our marriage has been blessed by the PREPARE/ENRICH company. I've scheduled my first fitting for my dress, and I go pick out our decorations soon for the reception. It's really happening! those invites are very cute! Thank you! I love them. She did a great job.